The National Aeronautics and Space Administration (NASA) is all set to send humans for the first time in eight years through SpaceX Crew Dragon. As part of the preparation, the NASA will first launch out a test flight on 7th January 2019 ahead of its scheduled flight. The SpaceX Crew Dragon can seat three astronauts but will be unpiloted for its first test flight which will be launched from NASA's Kennedy Space Center, Florida. It will undergo an in-flight abort test sometime before its first crewed flight in June. This flight will be known as Demo-1 (or DM-1). It will undergo an in-flight abort test sometime before its first crewed flight in June. 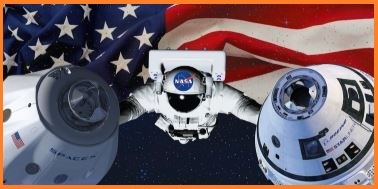 NASA astronauts Bob Behnken and Doug Hurley will be the first two astronauts to test the commercial spaceflight. The flight aims to provide NASA with performance data from the SpaceX spacecraft and also help the agency certify if the transportation system is ready for taking astronauts between the Earth and the International Space Station. As per information, Boeing's first uncrewed test flight is currently scheduled for March 2019, almost two months behind SpaceX. Both companies have to complete abort tests before their first crewed tests, which will happen in June for SpaceX and August for Boeing.